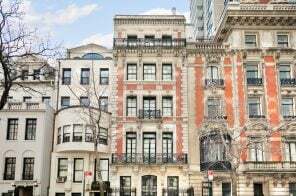 “The wealthy rub elbows with the poor — and are better for this contact,” said architect George Rapp of his Loew’s Jersey and Kings Theatres–two of the five Loew’s Wonder Theatres built in 1929-30 around the NYC area. The over-the-top, opulent movie palaces were built by the Loew’s Corporation not only to establish their stature in the film world but to be an escape for people from all walks of life. This held true during the Great Depression and World War II, but by the time the mid-60s hit and middle-class families began relocating to the suburbs where megaplexes were all the rage, the Wonder Theatres fell out of fashion. Amazingly, though, all five still stand today, each with their own unique preservation tale and evolution. The Loew’s Jersey, located in the bustling Jersey City hub of Journal Square, has perhaps the most grassroots story. After closing in 1987, the building was slated for demolition, but a group of local residents banded together to save the historic theater. They collected 10,000 petition signatures and attended countless City Council meetings, and finally, in 1993, the city agreed to buy the theater for $325,000 and allow the newly formed Friends of the Loew’s to operate there as a nonprofit arts and entertainment center and embark on a restoration effort. Twenty-five years later, the theater is almost entirely returned to its original state and offers a robust roster of films, concerts, children’s programs, and more. 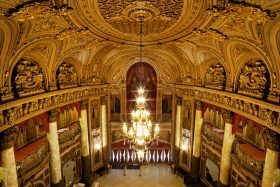 6sqft recently had the chance to take a behind-the-scenes tour of the Loew’s Jersey Theatre with executive director Colin Egan to learn about its amazing evolution and photograph its gilded beauty. 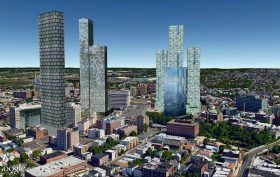 The contentious residential and office tower planned for One Journal Square in Jersey City is getting a second life today when Kushner Companies and KABR Group present revised plans for the project to the city’s Planning Board. 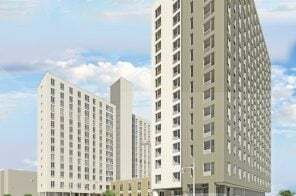 Earlier this year, according to NJ.com, the developers failed to get a package of city subsidies, a major investor and future tenant left the deal and a state tax break never came. The updated plan seeking approval includes two 849 foot tall, 56-story towers with 1,512 residential units plus retail and office space. 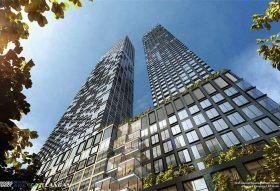 Older plans called for a 56- and 79-story tower with a total of 1,725 units. With significantly lower rents than Manhattan and a less than 20-minute PATH ride to the city, Journal Square continues to blossom into the next hip neighborhood. 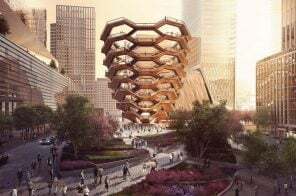 In addition to the 10+ major residential projects going up in the neighborhood, it’s also looking to become an official Art District. 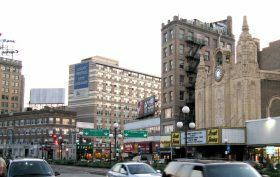 According to Jersey Digs, the newest project to follow suit is a two-tower, mixed-use complex at 808 Pavonia Avenue, adjacent to the historic Loew’s Jersey Theater. Developer Harwood Properties tapped Studio V Architecture to create a pedestrian neighborhood, focused on arts and cultural facilities. The migration of the New York development rush over to Jersey City was no surprise. Located along the waterfront, Jersey City boasts impressive views of the skyline and easy access into Manhattan from the PATH train. 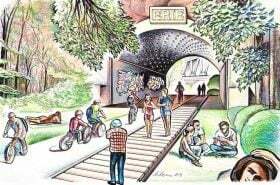 But as new development arrived at a rapid pace, it has resulted in rising prices and a lack of developable land. 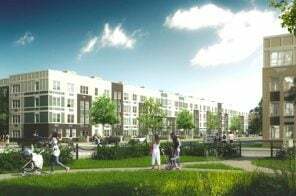 That’s caused developers to look inland in search of other Jersey City neighborhoods ripe for new development. Journal Square, the area surrounding the Journal Square PATH station, has clearly emerged as the new frontier. 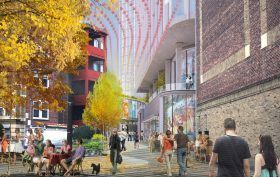 “We’re betting tens of millions of dollars that in the next 10 years, the neighborhood will be a brand on par with Brooklyn,” says Ken Pasternack, chairman of KABR Group, an active Journal Square developer.